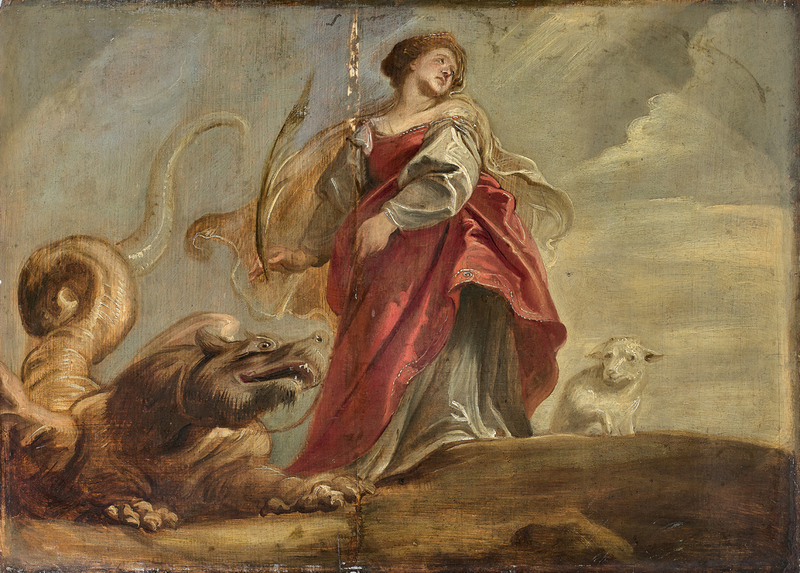 The Rubens oil sketch of St Margaret produced in 1620 for the decoration of the ceiling of the church of the Jesuits in Antwerp which sold for €1.3m (£1.12m) at Mercier et Cie in Lille. It was bought by a European private collector at the auction in Lille on March 31. The sale was conducted by Mercier et Cie assisted by the Old Masters experts Cabinet Turquin. Mercier had estimated the painting at €200,000-300,000 although specialists had expected it could well make more. The 17 x 18in (43 x 46cm) oak panel depicts St Margaret, identifiable by her attribute of a palm frond and a dragon and lamb signifying her triumph over evil. The sketch is one of 39 produced for the decoration of the ceiling of church of the Jesuits in Antwerp. The decoration was commissioned in 1620 when the artist had just returned from Rome, where he had seen and admired the ceilings produced by the Renaissance artist Veronese. At this time he was at the height of his fame and employed a studio with several assistants including Anthony van Dyck. The Jesuit commission is particularly well documented and from this we know that the arrangement in the contract was that Rubens would paint only the initial oil sketches for the ceiling while the actual large-scale works in situ would be executed by his assistants. This particular working method allowed the commission to be completed within a year. Detailed examination of the techniques used in the panel also confirm it as being Rubens’ autograph work. The artist is known not to have used preliminary drawings for his sketches, working instead with a brush in a brown preparation coating the surface. 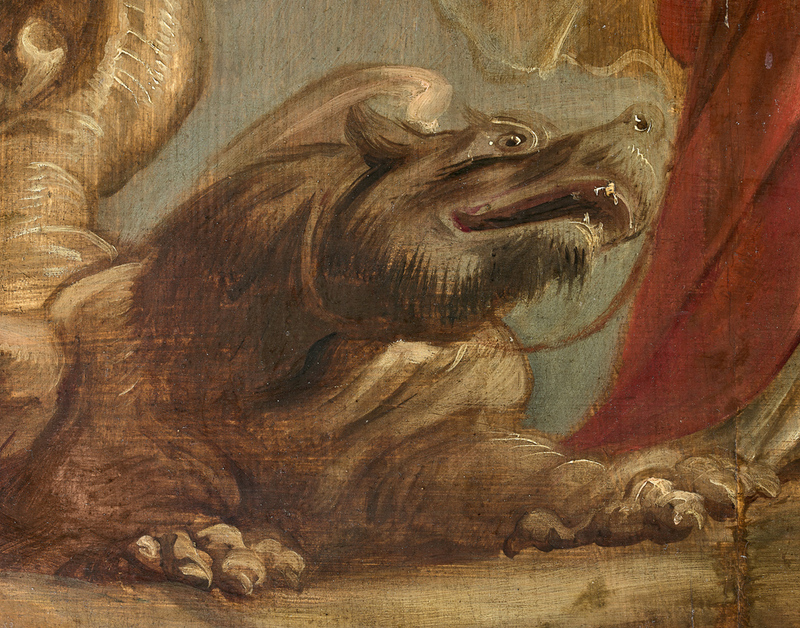 A detail of the dragon in the Rubens oil sketch that sold for €1.3m (£1.12m) at Mercier et Cie in Lille. “On his death hundreds of these sketches were found in his studio,” said Stéphane Pinta of the Cabinet Turquin. These sketches were not intended for commercial gain; instead the artist kept them to serve as a record of his ideas. Of the 39 sketches for this project, seven were painted en grisaille and the remainder, including St Margaret, in colour. While the proportions of the saint may seem a little distorted when viewed straight on, Rubens’ design was compensating for the fact that the finished painting would be seen from below and at considerable distance. In 1718 a fire ravaged the church and all the paintings were destroyed. Fortunately the scheme was documented by the Dutch artist Jacob de Wit, who copied 36 of the compositions as drawings in 1711-12, and by Christian-Benjamin Müller who made a set of engravings of all 39 just after the fire, allowing for a comparison with Mercier’s panel. Müller’s and de Wit’s copies show the finished work in its final oval format, as does Wilhelm von Ehrenberg’s 1661 painting of the interior of the Jesuit church in which the St Margaret painting is clearly visible in the top-right-hand corner.